Fuad Twal, the top Roman Catholic cleric for Israel, Jordan and Cyprus, criticizes building in Judea and Samaria. 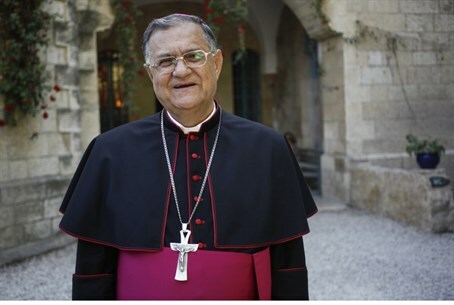 Mideast peace efforts are being "hampered" by Israeli construction in Judea and Samaria, the Latin patriarch of Jerusalem claimed Wednesday in his traditional Christmas message. Fuad Twal, the top Roman Catholic cleric in the Holy Land, stated that "the Israeli-Palestinian talks resumed in late July, after three years of interruption, but the efforts are hampered by the continuous building of Israeli settlements," according to AFP. "As long as this problem is not resolved, the people of our region will suffer," he said. Twal stressed that, "while the world's attention has shifted from the situation in the Holy Land to the tragedy in Syria, it must be stated that the Israeli-Palestinian conflict remains crucial to the region and is a major obstacle in the development of our society and stability in the Middle East." Shifting to the Syrian conflict, he called to "immediately establish" a "sustainable" ceasefire and to "prevent any entry of outside weapons." "As the Syrian problem cannot be resolved by the force of arms, we call on all political leaders to assume the responsibility for finding a mutually acceptable political solution that will end the senseless violence and uphold respect for the dignity of people," he said. Twal noted that instability in the Middle East "affects everyone, but especially our faithful who are tempted to emigrate," an allusion to the Middle East's dwindling Christian population. Despite Twal's singling out of Israel, the Jewish state remains the only Middle Eastern country whose Christian population is growing, as opposed to shrinking. Referring to Pope Francis, set to visit the Holy Land in May 2014 in a trip yet to be officially announced, Twal said: "He cares about the Holy Land and the Middle East." Both President Shimon Peres and Palestinian Authority Chairman Mahmoud Abbas have invited the pope to visit the Holy Land. Twal said Israel "wants to introduce changes" as part of negotiations with the Holy See on the legal and financial status of church property, which could include an end to tax exemptions. "Paying a little more or a little less is not the core of the issue," he said. "What is the important thing is not to 'touch' east Jerusalem, as it is still on the negotiating table. We do not want these agreements to have a political implication that changes the status of east Jerusalem, which was occupied in 1967." Twal is responsible for the tens of thousands of Catholics living in Israel, Jordan and Cyprus. This is not the first time he has used his Christmas speech to air anti-Israel views; last year, he declared that Christmas marks "the birth of the state of Palestine." The patriarch, who will celebrate Christmas Eve midnight mass in Bethlehem on Tuesday, condemned all "forms of religious fundamentalism," noting an "increase in acts of vandalism carried out by extremists that affected some twenty holy places or places of worship" under his care this year. The call came less than 24 hours after Britain's Prince Charles denounced Muslim-on-Christian violence from London. Violence against Christians has escalated in the Middle East and Africa over the past several years, particularly in war-stricken Syria, as well as in Iraq and Egypt.